These two beautifully carved menhirs demonstrate the high skill of the Neolithic workforce who carved, transported and erected these two majestic menhirs. The standing menhir is 8.75 meters high; while the fallen one measures 11 meters. It is the second tallest in Brittany after that of Kerloas at Plouarzel. The Kergadiou menhirs are aligned to coincide with the mid-summer solstice. 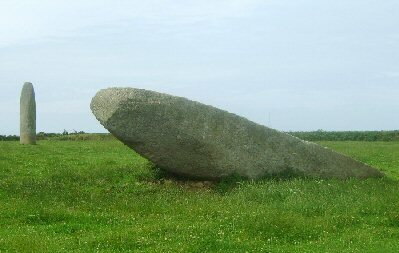 There are several other menhirs within close proximity to it, suggesting that it may have once been an important part of the Neolithic landscape of Brittany. These are two of the tallest menhirs in Brittany. 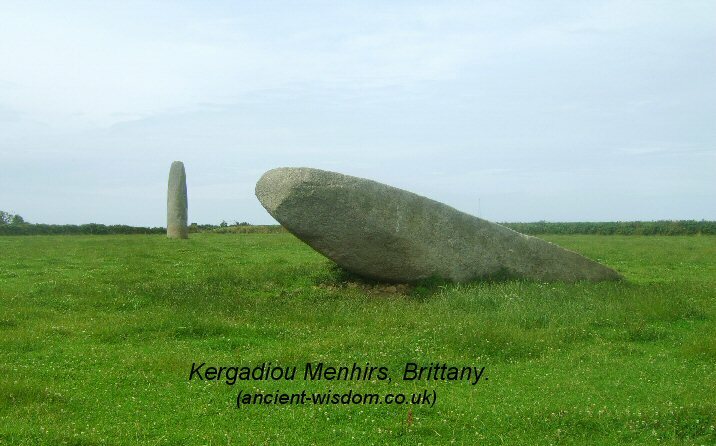 They are currently only seconded in size by Kerloas menhir which is approximately 30km distant. Their phenomenal size suggests a purpose behind their construction, an idea which may well have foundation when the Brittany menhirs are looked upon as a whole. Many of the most prominent Brittany (French), menhirs were placed in view of the coastline and/or were visible from miles around. The Kergadiou menhirs, near Plourin-Ploudalmezeau in Brittany, France. 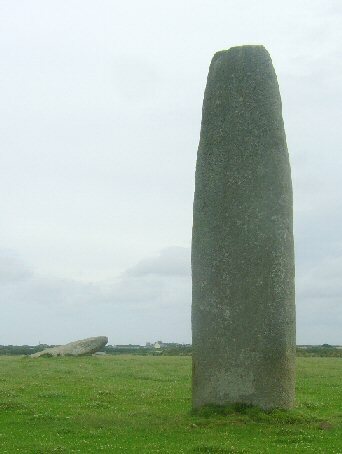 Both menhirs appear to have always had flattened, rather than pointed tops. During the Second World War, the Germans built a watchtower on the upright menhir and were apparently able to see the English coast on sunny days. From these two giant menhirs, it is possible to see the Kerloas menhir (barring the modern tree-line), and the sightline over the Kerloas menhir is apparently perpendicular to the midsummer sunrise and therefore, the azimuth of the two stones themselves, which if correct would mean that (when both standing), the shadows of each stone should have fallen on to the other at midsummer's sunrise and sunset. (They are orientated on an azimuth of 215° SSW). The upper surface of the fallen menhir has been pummelled perfectly flat. Its extra 2m length testifies to the suggestion that most menhirs can be estimated to extend approximately 20% further underground. It is suggested that the flattened surface was carved after the menhir fell as the other menhir doesn't have a flat face. While this seems reasonable logic, one has to ask why? 'According to tradition, the first menhir was stolen by a lady from Armorica from an old witch somewhere in the British Isles. In a fury, the sorceress screamed so loudly that she could be heard in Leon. 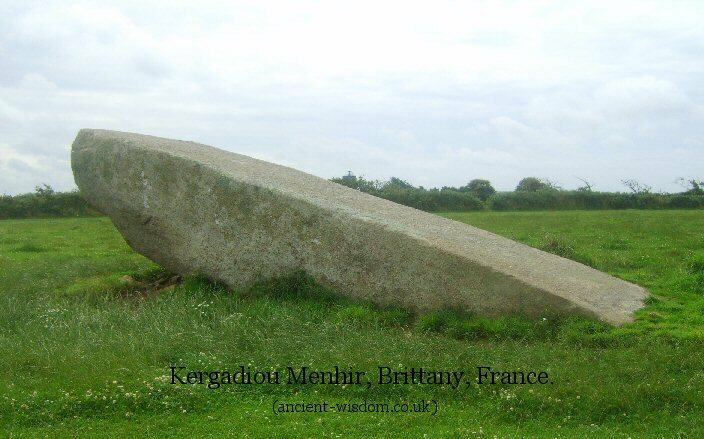 Then, summoning all her power, she threw a second menhir towards Kergadiou, to destroy it. But she missed her target and the megalith landed prostrate in the ground just 75m away'. 3). A. Service & J. Bradbery. Megaliths and their Mysteries. 1979. Macmillan.